How Many Private Lessons/Group Lessons Should a Junior Player Have In a Week? When talent is recognised on the tennis court, it is something certainly worth pursuing. Tennis can not only make for a potential career, but it is something that offers a lot of character building and positive muscle development, regardless of where you end up with the sport. There are some key attributes, such as sportsmanship, resilience, and determination that stem from being a tennis player at some point in life. Therefore, when young children show an interest in tennis and demonstrate a natural talent for the sport, it is understandable that their parents and coaches want them to pursue and keep on playing tennis. One thing that junior tennis players need to be careful with is not overdoing it on the court, whether in training or playing the game. There is the phrase ‘no pain, no gain’, but this applies a lot less to junior players. This is because children under the age of 16 are still developing and their bodies are still growing. Therefore, the sport needs be played in the right way to avoid injury or boredom. So, just how many private lessons or group lessons should junior tennis players have per week? Of course, this depends on personal circumstances, but generally speaking, to play tennis seriously, sports scientist recommend that junior players train for a maximum of 15 hours per week. This is very achievable when broken down throughout the week. 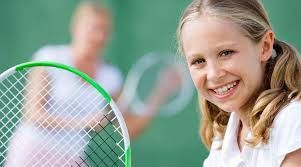 One other thing to bear in mind that, the younger a junior tennis player is, the less tennis should be the sole focus. Rather, it is better to have tennis played in conjunction with other sports. This helps the body, muscles, and coordination develop in a holistic way. Also, since young children have shorter attention spans, it prevents them getting bored of tennis. For junior tennis players, the International Tennis Federation recommends this amount of time per week per age group. The hours can be either in private or group lessons. For 6-8 years olds: 3-4 sessions a week, each session no longer than 45 minutes. Group lessons, practice on mini court. 50% tennis – 50% other sports. Soccer, handball, basketball, swimming, etc. Click through to find out more about our Junior Tennis Program in Singapore! Next Next post: How Often Should a Junior Tennis Player Train?